A higher proportion of young snapper in fishing areas north of Auckland are related to adult snapper from the Goat Island Marine Reserve, confirming what scientists have long suspected: the reserve acts as a giant snapper nursery. The new study from the University of Auckland's Institute of Marine Science is the first time scientists have studied a temperate commercial fishing species to find evidence of a direct parental link between adults in a marine protected area to juveniles outside. Led by Professor John Montgomery, Dr Shane Lavery, and former University of Auckland postdoctoral fellow Dr Agnès Le Port, the research team used a combination of genetic testing and hydrodynamic modelling of snapper larvae. They found at least 11 percent of juvenile snapper up to 40km away were the offspring of spawning adults from the reserve at Leigh north of Auckland, whereas no offspring matches were found to adult snapper sampled from non-reserve areas. "The contribution from the reserve is about 10 times higher than would be expected if snapper larval contribution was simply proportional to geographic area," Professor Montgomery says. An area of 400 square kilometres was included in the study, from Mangawhai in the north to Mahurangi in the south. Goat Island Marine Reserve makes up just 1.3 percent of the area studied. It is a 'no take' marine reserve meaning fishing is strictly prohibited. 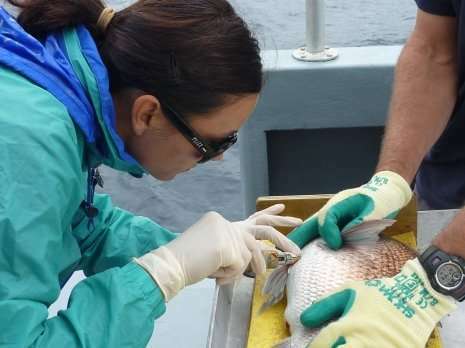 "This is the first estimate of the larval contribution of adult snapper from the reserve into the surrounding fishery and shows that even though the reserve is a tiny percentage of the area studied, it is more than pulling its weight in contributing to snapper populations outside." Previous research has shown that while snapper move over a wide area, resident snapper within the reserve tend to stay put for some time, forming a significant breeding population of large individuals. "Enough of them stick around within the reserve for our data to show a direct and significant link between the adults in the reserve and the juveniles many kilometres away." For the research, adult snapper within the reserve were caught, tagged and a fin clip sample taken before being returned to the water. The same technique was then used in non-reserve areas. Professor Montgomery says the hydrodynamic modelling work done for the study is the first time scientists have used the method alongside multiple genetic techniques. "Hydrodynamic computer modelling uses our understanding of tidal currents and wind patterns to predict where snapper larvae end up. The agreement between predicted dispersal and the genetic matches helps validate the modelling and its potential use in the design of future marine protected areas." The findings are published in Proceedings of the Royal Society B: Biological Sciences. Millions of Tiny Ships To detect Presence of Precious Rear-Earth Minerals, Platinum, Gold and Diamonds should be floating on the Oceans.....NOT Submarines TO KILL EACH OTHER !